...cannot be underestimated when creating, or indeed visiting, an eating establishment. As a self-proclaimed geography geek I am forever contemplating the effects of ‘space, place and time’ on the cafes I visit, having had these concepts carefully drummed into me as an undergrad. 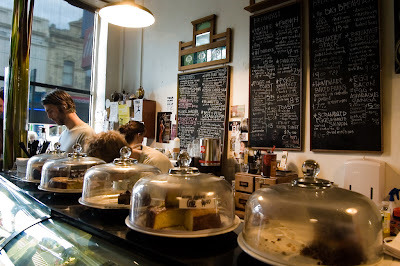 Space refers to the physical, three dimensional area in which the cafe exists. Place is a little more nuanced, suggesting the ways in which a space has meaning attached to it through the objects and relationships which inhabit it. Time simply refers to how places change over time - how they can seem so different depending on time of day, month or year. I’m interested to find out how spaces are transformed into places with emotions, memories and feelings attached to them. What makes spaces come alive? Why do some cafes make you feel stressed and claustrophobic whilst others instil you with a sense of quiet calm and inexplicable desire to while away a good few hours over copious [lattes/ cappuccinos/ drink of choice] whilst pawing over your favourite [book/ website/ person]. I believe a high-quality cafe is as good a place as any to have at the centre of your universe. In this often impersonal world, why not anchor yourself to a place which is warm, friendly and filled with food?